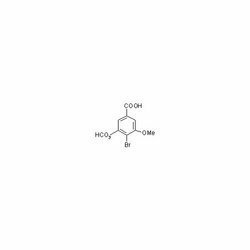 We are counted among leading manufacturers and exporters of a comprehensive array of 4-Bromo-3,4-Dimethoxybenzoic Acid, which is offered with the Cas no. 56518-42-4. It is cautiously formulated using quality assured chemicals, which are procured from trusted and leading vendors. We have also developed sound manufacturing unit installed with advanced machines and tools, which help us in processing the range as per the demands of our clients.